Nowadays Paris and London are two worldwide capital cities which marked their cultural diversity. 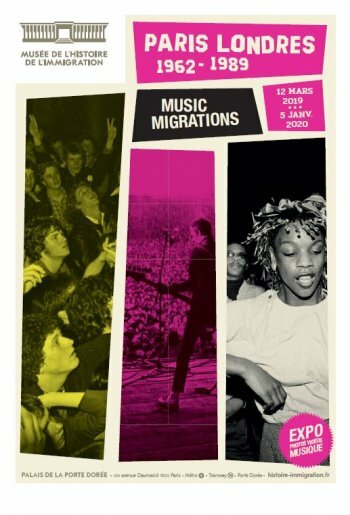 The exhibition Paris / London music connections (1962-1989) explains how music helped building the multicultural indentity of these two cities of ex-colonial empires. Immigrated populations favoured music, which is a universal way of expression, to communicate their claims. This immersive exhibition dives the visitor into production and distribution places of identity music such as record shops, night clubs etc. With numerous objects, screenings and contemporary art installations, you will be blown away by all the things to see. There is a recodring studio at the hearts of the exhibition where you'll fin th show-cases, master classes, workshops or screenings. Ska, punk, rock, rap, African and Caribbean musics...Lots of different styles will be explored. If you want to go futher in your discovery of music, you'll find activities for the young public at the Music museum for instance (music writing workshops, dancing, graphic creation fanzine...) and concerts of all styles in the parisian region like during the Night of Museums or the Fête de la Musique so stay tuned! You can also discover the multicultural district visits of the parisian area.